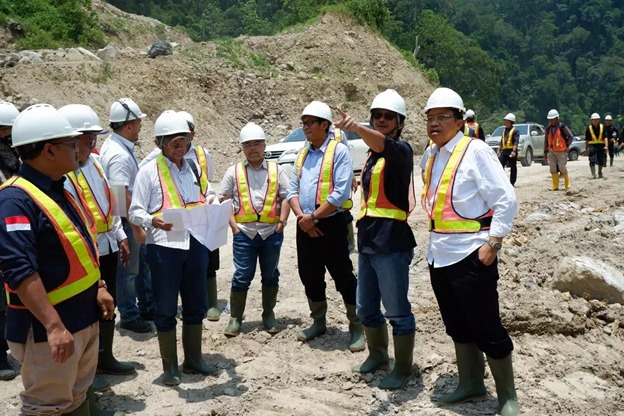 The ESDM Ministry's Director General of Electricity, Rida Mulyana, on Saturday (3/16), reviewed the progress of the construction of the Batang Toru Hydroelectric Power Plant (PLTA). The power plant located in Sipirok Village, South Tapanuli Regency, North Sumatra has a capacity of 510 MW (4x127.5 MW) and is one of the projects to accelerate 35,000 MW electricity generation. During the visit, Rida was accompanied by Director of Electricity Business Development, Hendra Iswahyudi, Regional Sumatra Business Director of PT PLN (Persero) Wiluyo, and Managing Director of PT Pembangkitan Jawa Bali (PJB) Iwan Agung Firstantara. Also present at the visit were the developer director of the Batang Toru PLTU, namely PT North Sumatra Hydro Energy, a consortium from PT Pembangkitan Jawa Bali Investasi (PT PJBI), PT Dharma Hydro Nusantara, and Fareast Green Energy Pte Ltd. The Director General of Electricity and the team ensured the progress of the hydropower project that Batang Toru was built on an area of ​​650 hectares and employed around 600 workers. Hydroelectric power plants that have financial close in 2017 are entering the construction phase and are expected to operate commercially (COD) in 2022. The construction of the Batang Toru Hydroelectric Power Plant is expected to increase and strengthen Sumatra's electricity supply, especially in North Sumatra Province, where the Batang Toru Hydroelectric Power Plant will be used as a peaker (electricity supplier when peak loads occur) in the Sumatra Power System. Later the electricity produced by the Batang Toru PLTA will be channeled through the 275 kV transmission network owned by PT PLN (Persero). The Batang Toru Hydroelectric Power Plant is also expected to contribute to saving fuel oil (BBM) equivalent to 383 million USD or around five trillion rupiah per year. This is in line with the government's policy to continue suppressing the Cost of Supply (BPP) of electricity, to keep electricity tariffs for the community competitive for the industry and affordable to the public. Other benefits from the development of the Batang Toru Hydroelectric Power Plant include increasing the renewable energy mix, reducing carbon emissions, increasing local government revenues, and increasing employment. The addition of electrical power from the Batang Toru hydropower plant and the increased reliability of the electricity system in South Tapanuli Regency are expected to increase the Electrification Ratio which currently reaches 82.32%. End of report from developers that they have made various efforts related to the recommendations of the Ministry of Energy and Mineral Resources and the Ministry of Environment and Forestry (LHK) to build wildlife trajectory corridors namely the Tapanuli Orangutan which has been naturally through connecting trees.